Prepare the crust: Place a large 18-inch by 18-inch square of aluminum foil on a flat surface. Place the springform pan in the middle of the foil, and gently fold up the sides of the foil around the pan. Crimp the top of the foil sheets around the top edge of the pan; set aside. Preheat oven to 350°F, with rack in lower third of oven. Pulse the graham crackers in a food processor or blender until finely ground. Put in a large bowl, and stir in the sugar and salt. Use a wooden spoon to stir in the melted butter. Clean the food processor, and set aside. Pour the graham cracker crumbs into the bottom of the springform pan. Gently press down on the crumbs using your fingers, until the crumbs are a nice even layer at the bottom of the pan, with maybe just a slight rise along the inside edges of the pan. Place in the oven for 10 minutes (or until fragrant). Remove from the oven and let cool. Reduce the oven temperature to 325°F. 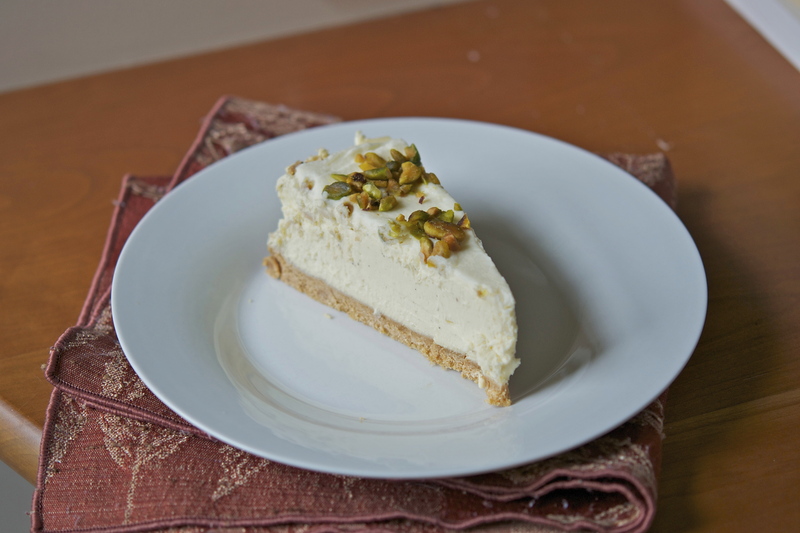 Make the filling: Cut the cream cheese into chunks and place in the bowl of your food processor. Pulse for 1 minute, or until creamy – add the sugar, and pulse for 1 minute more. Add the salt and vanilla, pulsing briefly after each addition. Add the eggs, one at a time, pulsing for a few seconds after each addition. Add the sour cream followed by the the heavy cream, pulsing briefly after each addition until incorporated. Remember to scrape down the sides of the bowl, and scrape up any thicker bits of cream cheese that have stuck to the bottom of processor. Prepare 2 quarts of boiling water; set aside. Pour the cream cheese filling into the springform pan, over the graham cracker bottom layer. Smooth the top with a rubber spatula. Place the foil-wrapped springform pan into a large, high-sided roasting pan, and then set both pans into the oven on the lower rack. Carefully pour the hot water into the roasting pan (without touching the hot oven), to create a water bath for the cheesecake, pouring until the water reaches halfway up the side of the springform pan, about 1 1/4 inches. Cook at 325°F for 1 1/2 hours. Make the topping: in the bowl of a standing mixer, beat the mascarpone until smooth – slowly add the heavy cream until fully incorporated, then up the speed to high for 1 minute. Add the sugar and beat for an additional 1 to 2 minutes. 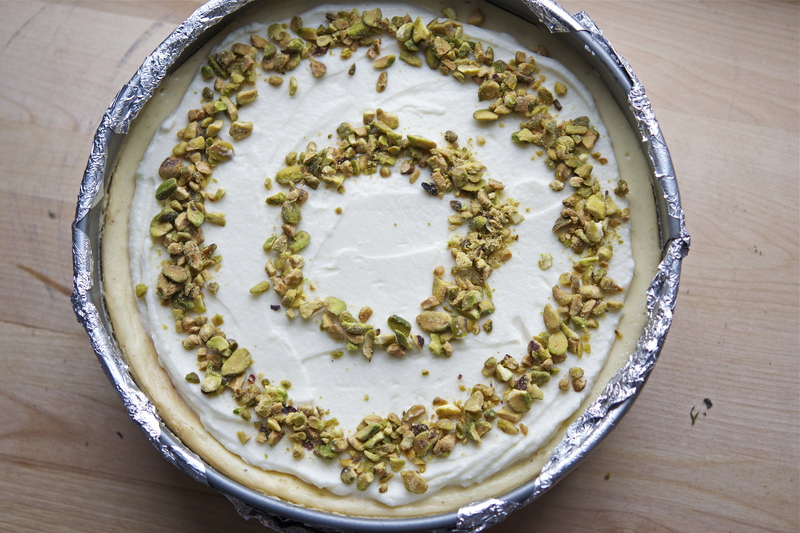 Carefully spread the topping on the surface of the cheesecake, and sprinkle with crushed pistachios.